If you are passionate about darts and enjoy the game a lot, it’s always important to learn how to play and also acquire the right equipment. Sure, you do need some high-quality darts, but you also need the best dart case to go along with it. If you can get more than one dart case, that would be even better. Most players tend to have at least a set, if not two, so getting multiple cases can indeed come in handy and it will just make your entire experience a lot more rewarding and interesting in the end. How to Choose the Right Dart Case? It is not practically possible to spend money again & again for a dart case. Rather I think, it will be the right decision to buy a quality dart case by spending some time through consideration of some things. I guide you on what to consider when you are going to buy a dart case. Material: The material is an important thing that ensures the durability & lasting quality of any products. In the case of dart case material, you should take into consideration the quality material also. There are metal, nylon/fabric and plastic material making dart cases. Now I am showing these materials features & benefits differently. The metal making dart cases are very hard in quality & professional in looking. These types of dart cases are also strong enough than fabric & plastic dart cases. If you buy one you will get great protection & portability for your darts & accessories. Plus, metal cases come up with ultra level security also. Nylon/Fabric cases offers a level of quality within a range of price. They also give a level of organizing, protection & portability. The last option is the plastic dart cases. These don’t actually offer as much protection as metal or nylon/fabric dart case can give. You can get one within the low price. Storages Capability: The storage capacity of the dart case is an important factor. Because It defines how many darts, flights, & barrel you can store. So, when you are going to pick a dart case you should select the one that is able to store more. The more storages enable you to carry more when you go to pubs or others public places for playing. And the same the much storages offer you much more facilities to adjust your throwing, grip & style. Purposes- For Competition or Home: The purpose of you intend to use the dart case is also very important. It varies according to your demand. If you are a competitive player and join the darts tournament that takes place all over the world. For that, you need to choose the hard metal dart case because of its durability, mellifluous and professional looking. Not only that it offers the higher level of protection & transportability for your darts & accessories. Even in your home, you need to organize your darts & accessories. In this case, you can choose the one that gives away the best organizing & protection solution according to your numbers of darts & accessories. If you’re a traveler and you also enjoy playing darts, this is the perfect unit for you. It works amazingly well and you can take it with you anywhere you want to go. This is great for the pro dart player and for casual players too. 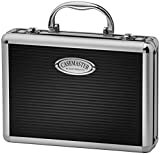 When you see the Casemaster Legion 9 Dart Aluminum Storage/Travel Case, you will be impressed with it. This is one of the large dart cases that everyone needs to have in their home. It’s particularly geared towards professional players, but at the same time, it can also be good for beginners too. The Casemaster dart case is created from aluminum and it can store 9 darts in total, in sets of 3s. it has 12 pockets for accessories and 10 mini sleeves. They even added 2 accessory tubes for the other gear, which is really interesting and unique. The thing to notice is that some of the additional spaces can be tight, so you are unable to use all of them. However, if you get the Casemaster dart case for protection, you do get your money’s worth and then some. The exterior is very rigid, durable and powerful. It seems like a small briefcase, and it definitely delivers the type of value and quality you would expect from a briefcase, which is telling a lot. The manufacturer also added double buckle locks here, so you will be sure that the case is closed unless you choose to open it at any given time. The addition of so many pockets, a great double buckle locking system and the fact that you can carry up to 9 darts at the same time does make the Casemaster dart case a winner in the case of those best dart cases on the market. Doesn’t include all the darts and accessories. Final Verdict: This is a great product for people that want to acquire the ultimate protection for their darts. Granted, it’s pricey and its extra luggage, but if you want to play professionally you need this! With the Casemaster Elite you have a very good soft tip dart case experience. This removes the need to have a separate luggage for your darts, instead you can use this in your own case. It’s really portable and reliable. In case you want a soft tip dart case, this might very well worth for you. The trick with this model is that it focuses on less expensive materials, and that makes it more affordable. And yes, it’s great for darts with a soft tip, which means the material is designed to keep your darts in place, all while making sure that the tips will not be damaged in any way. You can keep 2 sets of darts in here, you also have 6 pockets for flights, 2 storage tubes and so on. The storage tubes are good if you want to hold shafts or whatever element you might find handy. That being said, you will notice that there are foam inserts in there, and those will help keep your darts in the same space at all costs. However, you will notice that the foam gets softer and softer all the time. Which means you might have to replace it at one point. It’s not exactly the dealbreaker you might expect, but it is something to consider. They also have 90 days of warranty, so if you encounter problems with it you can easily give it back for a full refund. We also like the fact that they have a moisture-wicking exterior. This is the type of thing that really works the way you want and it has the potential to do wonders if you use it the right way. So yes, this soft tip dart case is worth it, especially considering its affordable price. Perfect size for keeping darts. Dual system tube for keeping shafts & tips. Comes with the only one color. Doesn’t’ include any darts or accessories. Final Verdict: From the interior to the overall high quality, this unit has it all. The warranty system is great, the only thing is that you need to pay attention to it. As the foam can get soft at times. Personalization is key if you want a wonderful darts case. The black here makes it very suitable for any case you want, and it does tend to work very well for all players, especially newcomers. When it comes to a personalized dart case, you can rarely go wrong with the PerfectDarts product presented here. The combination of fabric and nylon really pops and it manages to showcase an impressive build quality that you will like quite a bit. What a lot of people notice with it is that despite its small size you can host 2 sets of darts, which is really impressive for it. However, it’s a soft model so you still need to be careful with it. Putting too much pressure on it can damage your darts if you’re not careful. To their credit, they added quite a lot of padding to the interior, so you don’t really have to worry about a ton of damage or anything like that. The darts are kept in place thanks to a band. It’s a good idea to make sure that you take the darts gently from this personalized dart case, otherwise, you can damage the case if you’re not careful. They also added a nice feature in the form of the carabiner clip. This makes it easy to attach the case to the belt loop and you can carry it around as you see fit with its help, which is always a great thing to have. The median price range makes it unique and also quite accessible. It’s definitely not the cheapest product on the market when it comes to dart cases, but it’s not super expensive either. Lots of room for storage. You can hang it on your belt. Small, but it can fit 2 sets. A good combination of fabric and nylon. Final Verdict: The product is very easy to personalize, you get plenty of space in it, although you need to be careful with it. But the design is extraordinary and it’s a great purchase to consider. The Double Deluxe case helps you host 2 dart sets, so if you are a semi-pro this can be great for you. The unit is also suitable for casual players that enjoy their time and just want to travel with their darts without a problem. The Metroline dart cases are always impressing people. Even if it’s a soft case, the combination of fabric and nylon makes it really sturdy and just a pleasure to use whenever you want. It will be a great unit that helps protect your stuff from external factors. As the name suggests, you can have 2 sets of darts in there, which is more than ok for the most part. When it comes to the interior, the Metroline dart cases has a heavy duty plastic holder. The case on its own has a Velcro strap too, not to mention a zipper in case you need to use it. This will bring in front some amazing benefits and the results as a whole can be very distinct and professional for sure. You also have a single Velcro storage pocket inside the bag, so aside from the darts themselves, you can’t store a ton of accessories. It’s certainly not what a lot of people expected, but it’s still pretty good nonetheless. The primary power behind this unit is certainly its portability. You have heavy-duty plastic, as well as the ability to fit 2 sets of darts in there, which is more than fine for the most part. Who should get these Metroline dart cases? Usually, it’s for the casual player and even for the medium experience player that wants a good case to carry around and use at his own convenience. It’s important to notice that the product looks great, it does have a premium feel and you can impress everyone with it. Hosts 2 sets of Darts. Don’t have more colors options to pick. Don’t have enough space for storing darts accessories. Final Verdict: This one of the better Metroline dart cases on the market. It looks great, it has a plethora of interesting features and you can carry it around in no time. They also have special storage for extra stuff. Every casual player will like this case because it has a great container where it fits every dart piece perfectly. The unit is focused on portability, you can carry it near your pockets and it’s also durable. That makes it great for all kinds of players. Ideal for anyone using a molded dart flight set up like Fit Flight, L-Style and Harrows Click to name a few. A lot of people like the Metroline dart cases because they are very portable and this one certainly has that sort of allure and quality. What you will enjoy about it quite a bit is the great attention to detail. It’s a unit that you can place right at the belt buckle and you will be able to carry your darts around in no time. As you can see, it’s not a very large unit. On the contrary, it’s pretty small but that doesn’t really detract from the value of this product. Not at all actually. It can host a set of darts, 8 shafts or tips and it can even store a player card. Granted, it’s not that large but it’s affordable, portable and also just a pleasure to use. The color combination is quite distinct and interesting, and they did a great job with the huge array of benefits brought to the table. They are definitely offering a plethora of cool visuals and for the most part, you will be very happy with the way everything works. Again, this is a soft model, so you need to be very careful with the way you use it and store it. But the interior is rather sturdy so while it doesn’t really feel extraordinary, you do get plenty of value for the money. If you’re a steel tip or soft dart player, you will find it pretty good. While it’s not a great model for serious players, it’s definitely a good one for beginners and people that just want a proper dart case. For the most part, you will be incredibly happy with the value you receive here. Price a little bit high. Final Verdict: When you need a portable dart case, this is a great option. You have lots of colors to choose from, the product is very sturdy and you will never have to worry about portability either. All in all, it’s a rather powerful and reliable tool! In the end, finding the best dart cases is all about the features you want and what you can expect from a product like this. It’s never easy to find the best possible case as all of us have different requirements. But if you have enough patience and focus on the best value, the outcome can be great. It’s never easy to achieve resounding benefits, and that’s why you do have to at least test it out to achieve a great outcome. Don’t rush as you try to find the best dart case for you. If possible, go to the store, see which ones you like and what designs suits you the most. In the end it will be easier to find the right one this way!